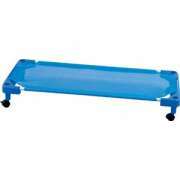 Choose Preschool & Toddler Cots: Shop Our Great Selection! Your little charges are tired . . . so dim the lights, turn on the soft music and pull out your toddler cots. Our kindergarten nap mats feature removable, washable fabrics, durable frames and extra-high flammability standards for years of safe and sturdy use. 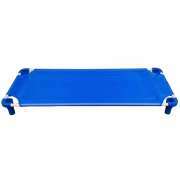 Convenient carrier conversion kits and mat caddies are available for easy storage and mobility. What will make little ones comfortable during naps in daycare? Our selection of preschool and toddler cots ensures that everyone can rest comfortably. For an extra-soft option, try our selection of cozy sheets and blankets. With the right combination, preschoolers will be so comfortable that they will feel right at home. When little ones are first attending school or daycare, it is very important to give them time to rest so they have plenty of energy for all of the wonderful activities you have planned. With lightweight, stackable daycare cots, you can keep portable napping spaces close at hand without taking up too much space in your classroom. Cozy kids cots provide the support your little ones need to doze off peacefully. When nap time is over, your cots can easily be stacked in a corner or moved into a different room. What size kids cots do I need? Between all of the exciting activities, social interaction and preschool learning centers your young learners experience throughout the day, they will generally need some quiet time to wind down and rest. Many children need a nap during the day, and it is important to make sure that they have a proper place to take one. At Hertz Furniture, we know that it&apos;s not just your youngest students who might need a chance to calm down and rest. Our cots for kids come in both toddler size and full size, so even kindergarten students can lay down and take a break if they need to. 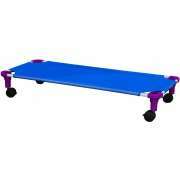 Although their size fits younger and older students, they are safe for little ones as well. How can I make sure that my nap arrangement is safe? All of the preschool furniture we sell is safe for little ones and will help them learn and grow. Our toddler cots and rest mats are no exception. They are designed to keep little ones snug and secure as they doze off and enjoy sweet dreams. Our kid cots have a low-profile which prevents tipping, and rounded edges which eliminate pokes and scrapes. Where can I put the preschool cots during the day? 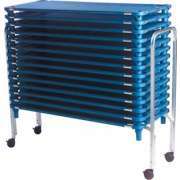 We have a number of great storage solutions for your preschool cots when they are not in use. 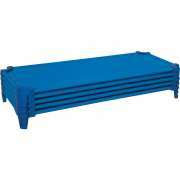 Interstacking cots from Mahar Manufacturing are convenient to setup and cleanup. They feature an adjustable cover that can be tightened as needed, to provide the firmness children need for finding a comfortable resting position. 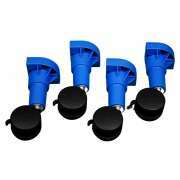 They are available in a choice of bright corner colors with either blue or rainbow surface material. Mahar daycare cots even include name tags, so you won&apos;t get confused about whose is whose. Optional casters are available for easy mobility, so you can easily store your nap cots outside of the room and just wheel them in when it&apos;s time to use them. 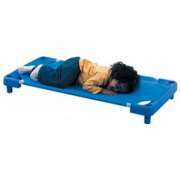 Children&apos;s Factory kid cots have a smart design that makes them a great choice for your busy nursery school or daycare. Their moisture-proof surfaces will not get damaged by spills or accidents. For instant portability, any single daycare cot can be easily transformed into a mobile cot carrier when you purchase the required kit. There is even the option of ordering a cot-topper to place on the top of your cozy stack so your resting spaces won&apos;t become dirty or damaged. Should I get my preschooler a kids cot or a rest mat? In a daycare which provides sleeping arrangements for nap time, kid cots are great. However, if you are looking for something portable, flexible and compact, kindergarten nap mats are definitely preferable. 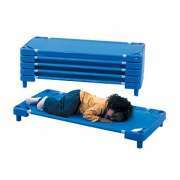 Rest mats are a cozy alternative to daycare cots if you want a bit more padding and you don&apos;t require raised platforms. Daycare nap mats can be laid out in no time as your young students prepare for a quiet break from the busy and exciting day. Cushy, colorful nap mats will transform your floors into the perfect space for a short rest - or even a longer one. 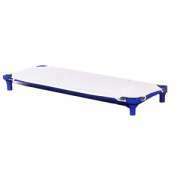 Rather than stacking your rest mats and carrying them into storage, you can easily roll them anywhere you want on a storage trolley or heavy-duty caddy. Both of these options accommodate many mats at one time. With great mobility, you can simply stack your mats and transport them to wherever they are needed. How can I make little ones feel at home during preschool nap time? Help your little ones feel at home in school by making their nap spaces as cozy as possible. We offer a selection of soft sheets and blankets that will make your temporary classroom resting spots more inviting. These washable linens will help your cots and mats maintain a fresh look, even after many years of use. Hertz Furniture offers daycare cots and preschool mats that are designed to help young learners remain cozy and content during nap time. When children rest well, they wake up refreshed and ready to enjoy all of the wonderful activities you have planned. If you need help choosing the best nap solution that will fit with the layout of your daycare, childcare center, preschool or kindergarten, call the Hertz Project Solutions team. Who knows? With nap mats from Hertz Furniture, you may just be tempted to curl up too.